Busload of Horror III: Laugh ‘Til You Bleed (And Vice Versa) | "DESTROY ALL FANBOYS!" Tom vs. The Armies of Hell: From Darkmire Entertainment (or Sean Burgoon) comes this hilarious spin on Diablo, Army of Darkness, a dash of Office Space and maybe a teeny-tiny bit of Half-Life (if you squint while hitting yourself in the head with a hammer at just the riiiiight spot) that’s going to tickle your funny bone as it tests your skills. You’re Tom, a low on the totem pole software engineer having the worst day at work ever (outside of Gordon Freeman’s of course) after all Hell figuratively (or is that literally?) breaks loose and you need to stop things from going further south. The isometric view and chase ‘n chop gameplay will be familiar to Diablo or similar ARPG fans, although the game takes a bit more finesse in using skills-based attacks and drawing energy from dead demon spirits to power your weapon. Enemies tend to be fast and cheap, bosses are room-sized and cheaper, but all are bested by the best who remain calm under pressure. The game is still pretty tough on the easiest setting (or was until the last patch that lightened the difficulty up a bit), but it’s a challenge worth accepting if you like your games funny and sliding in winks and nods to all sorts of cool stuff. As admirable and fun as the game is, even more so is Burgoon’s tweaking and fixing up bugs when players come across them. If only every developer was so responsive and self deprecating as this guy. $12.99 gets you this one on Steam and it’s worth it. I have not a single clue what Darkmire has up it’s collective one-man sleeves as an encore, But if it’s more tongue-in-cheek goofiness such as this, I’m in and smiling already. 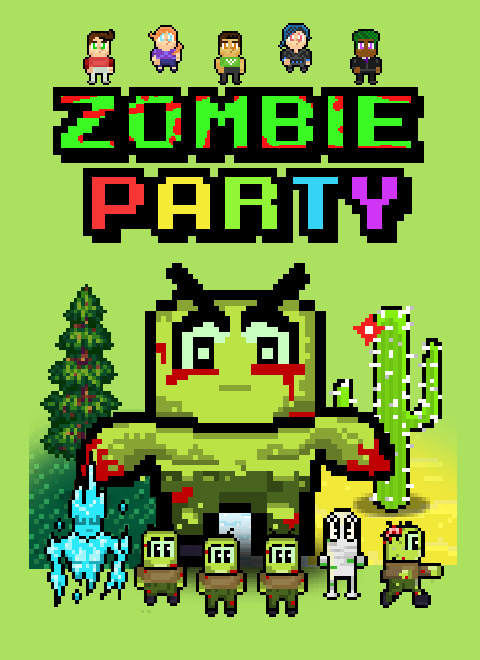 Zombie Party: If you like your chaos a lot more chaotic and want a few friends along for the ride, developer Peach Pie Productions (Ben James) and publisher Black Shell Media have a little party you should attend alone or with up to three friends. 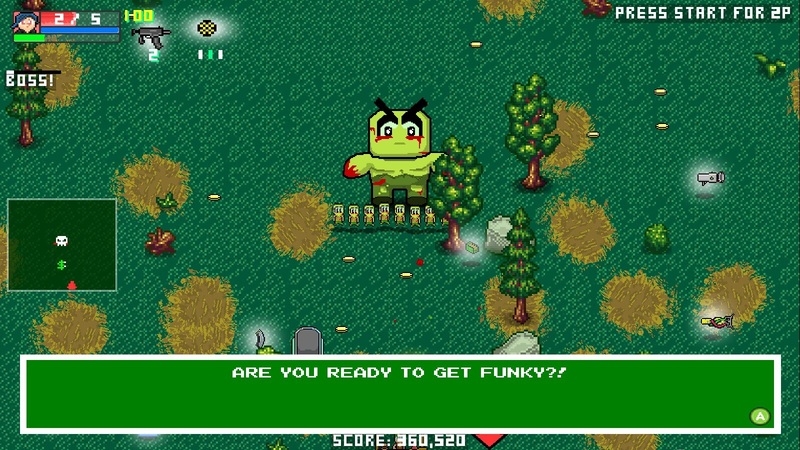 ZP has distinctly different game modes, loads of challenge and is one of those “retro” games that has a nostalgic look to it while delivering endless fun. Adventure is a survival wave/Boss battle-fest, Dungeon gives you more of a rogue-lite run ‘n gun deal, Arcade gives you ten thousand monsters to kill before the clock runs down and yep, I’m still trying to figure out what the Pet Sanctuary does. The game’s simple looks and excellent tunes do a great job of sucking you in for long play sessions where ammo management and learning which weapons to use is key to survival. You’ll still die a lot, but if you’re good enough it’ll be further and further in the game than your previous attempts. While not laugh out loud funny, the chuckles you’ll get here will come more from clearing a boss map you’d previously died on multiple times, or making it to a really high level right before you lose it all after getting shot up by a cute flower you didn’t see placed on the blind side of a tree. Ah, procedural generation… you make it all worthwhile sometimes! Your entry fee for this part? Only $9.99 on Steam for a hot time you’ll treasure over and over. 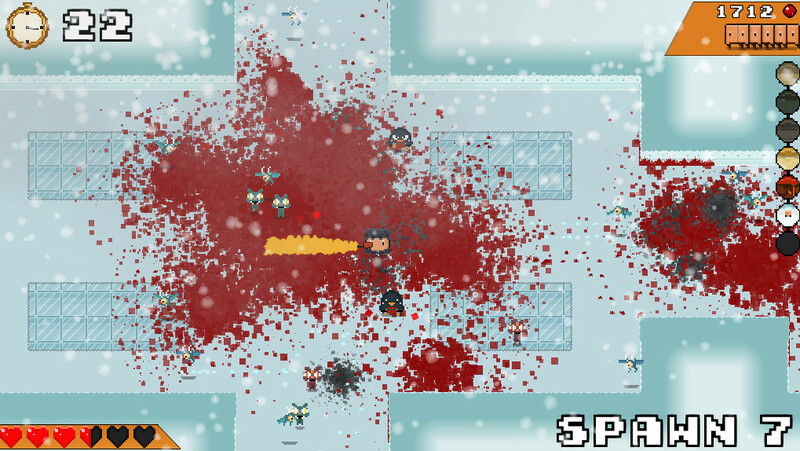 So Much Blood: Want cheap, super pixel packing, bloody good fun with a twist? At three bucks, this one’s pretty cool once you wrap your square head around the odd gameplay. You can move in eight directions, but ONLY shoot left or right, making the game highly challenging from the outset. That said, once you get how this works, it’s all about relearning how to play this game (and only this game) the way it’s intended. The game has no instructions, so a few things such as that countdown clock and what it has to do with enemies spawning will need to be figured out as you go. 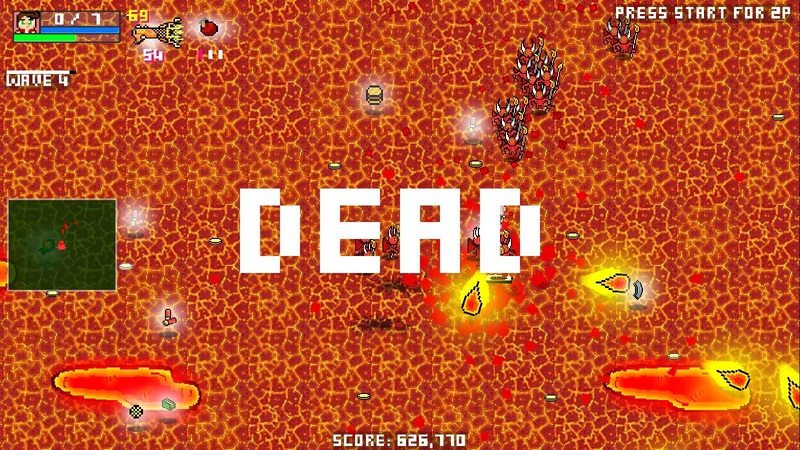 The initial frustration turns to fun as you come to grips with the enemy types and weapons required to take them down quickly and the game even pits you aganst multiple cheap bosses just to see if you’re paying attention. Made by Coding Made Simple (Zachary Berenger and Eli Aldinger), a pair of guys who’ll teach you how to make your own games if you’re looking to do so. Nice. Yep, it’s another Black Shell Media-published game, in case you were looking at link in the game recommendation above and were wondering why that name sounded so familiar. We seem to be done here, but tomorrow, a few more bloody and amusing titles will join the battle for your attention. See you then. This entry was posted in 2016, Commentary, DAF, Features, Humor, Updates and tagged Black Shell Media, Buy These Games!, Comedy, Darkmire Games, Digital Games, Downloads, Gallery, Halloween, Holiday Gift Guide 2016, Horror, Horror Games, Indie Games, Mature, Music, Not For The Kiddies!, PC, PC Games, Reviews, Scary Stuff, Screenshots, Shut Up And Play It!, So Much Blood, Soundtracks, STEAM, Tom and The Armies From Hell, VGA 101, Videogame Appreciation 101, Videogame Reviews, Videogame Trailers, YouTube, Zombie Party by geelw. Bookmark the permalink.